- Dismantle of Arena took less then 24 hours. Please let us know if you heard about something similar. The Halle 2 of the Karlsruhe trade fair has recently been converted to an indoor athletics arena for 2 major events. The 200 m track with infield, a product of Kanstet, was already used before during the 2013 European Indoor Athletics Championship in Gothenburg. On January 31, 2015 the hall will its capacity for 4.300 spectators will host the Indoor Meeting Karlsruhe with international participants. On February 21 and 22, 500 athletes from Germany will be competing here during the German Championship. After her victory in London 2012, Ms. Olga Rypakova deservedly becomes a Kazakhstan’s national hero. Country president Mr. Nursultan Nazarbayev came out with Idea to build modern Indoor Athletic Arena at Olga’s home city Oshkemen. Well known under its former name Ust-Kamenogorsk, founded in 17-th century 300 000 people’s city situated at eastern part of country on the banks of Irtysh and Ulba rivers. New Indoor 200 m Athletic Arena would have 6 oval & 8 sprint lines, two separate landing areas for Long & Triple Jump, Pole Vault, High Jump and Shot Put facilities. The warm up facilities at the next door allow to pretend for IAAF certificate as Construction Category I (highest of possible). Kanstet crew jointed project earlier in May this year by issuing technical documentation for construction of concrete casted permanent banked bends. We designed construction on 26 radial supporting legs. This letter is to officially notify the management of Mondo Spa, Piazzale E. Stroppiana, 1, 12051 Alba, Fraz. Gallo - Italy - about the false news message published on their website following the link below. The marketing department and/or the management of Mondo might not be aware of the fact the IAAF World Youth Championships took place on a Regupol AG/a VSS-1 athletic track surface installed by Kanstet Ltd., and NOT on Mondo Super X Performance. An official IAAF Class 1 Certificate was issued for RSC Olympisky in Donetsk earlier July 2013 which should provide the necessary evidence on the truth about the athletic track surface which the records were set on that Mondo report about in the above referenced news article!? We sincerely hope that this news article will be removed from Mondo’s website immediately, and that we will not have to seek legal action against Mondo Spa for steeling such a prestigious reference from us. While the previous athletic track surface at RSC Olympisky was a Mondo surface, we are able to provide you with numerous photos taken during the removal process of your old track last summer. This notification will also be delivered to Mondo's office by registered mail within the next few days. We expect that the news article will be completely removed by July 25, 2013, otherwise we will enter into legal proceedings accordingly. 16.07.2013 Engineering support in Africa. LOC of 2013 NUGA games contracted well known Nigerian company Vast International to rebuild existing OAU track to modern IAAF Certified Class II facility. Built over 30 years ago cinder track has only 6 oval lines, tight High Jump fan and short Javelin run ups, Pole Vault and Long / Triple Jumps doesn’t exited already long time, the steeple chase water jump is extremely dangerous. Together with Vast International, founded and managed by Mr. Obiora Okoye, our company provided renovation project of OAU Track. Instead of six, the new Track would have eight oval 400 m lines. Long and Triple Jump brought closer to the main stand, full size “D” area provide convenience to high jumpers and throwers. Already many years Vast International builds Olympic size swimming pools in Nigeria, therefore company staff have great experience in casting of concrete. To be independent of sub base contractors and their more than scholastic behavior to the job, Vast International decides to take over responsibility of all jobs and prepare concrete substrate themselves. We are proud of our long term partner intention to become “turnkey basis” contractor in the field of Running Track’s construction and Kanstet Ltd. always will provide necessary engineering support and supervision. 2013 year NUGA Games is scheduled to mid of October. Analyzing progression of the job on site we feel confident to hand over new Track to Obafieme Owalowo University already in September. From July 10th to 14th, in Donetsk the World Youth Championships in Athletics were held. The Ukrainian city Donetsk hosted over 1,500 young athletes from 165 countries members of the IAAF. The viewers in RSC “Olimpiyskiy” Stadium were able to attend five days filled with great excitement and surprises, especially in the running events, which were ran on Kanstet’s VSS-1 and Regupol AG /BSW track. The biggest surprises showed in the 100m finals: in the men’s Chinese Mo Youxue won with a photo-finish, setting his personal best time of 10:35. Girls sprint; the American Ky Westbrook emerged with her personal best time, 11:33, just 0:02 slower of the event record. Two of the finals of the 100 m disappointed, but those in the 200m didn’t: the Swedish Irene Ekelund triumphed with a time of 23:03, setting a WYC record, the Jamaican Michael O'Hara won in 20.84, with the best student performance of the year. The Jamaicans were successful even in hurdle races: in the 400 m/h Marvin Williams stopped the timer at 50.39, best youth performance of the year. In 110 hurdles, another record of event set by Jaheel Hyde. In the 400 m hurdles women, as predicted success for the South African Helene Swanepoel, who ran the fastest youth performance of the year with 58.08. Great excitement in the bottom and middle distance races, starting with the extraordinary race of the Japanese Toshikazu Yamanishi in the 10,000 m, the first Japanese athlete to win gold in a race on the track at the World Youth Championships. In the 800 m was impressed by the pace of Kenyan Alfred Kipketer, who won in a way that was reminiscent of the David Rudisha’s race in London 2012. In the women's 800 m, Icelandic Anita Hinriksdottir set a new record at the Championships, running 2:01:13. Among the stars here in Donetsk, Romanian Florentia Marincu will be remembered as the second athlete in the history of the World Youth Championships to win both the long and triple jump. The only athlete in this edition to have won two gold medals in two individual disciplines. At the end of five days, leading in the medals was Jamaica, with 6 gold and 2 bronze medals. Conclusively; 15 Championships Records were upgraded and 3 World Youth Best Performances improved here in Donetsk. We are happy to let you know that way to great success is paved with synthetic surfaces VSS-1 and Regupol AG made by Kanstet Ltd.
Today IAAF granted Class I Facility Certificate to our renovated Track in Donetsk / Ukraine. Regional Sport Complex “Olimpijsky” is hosting 2013 World Youth Championship in Track & Field. Track surfaces are well-known Regupol AG manufactured by BSW and Kanstet’s VSS-1 which already has outstanding debut on EAA European indoor Championships 2013 last March. Since November last year we started to manufacture IAAF Certified in-ground equipment for Running Tracks & Fields. So our new equipment is in use on World Championships. We wish to all athletes improve them personal best performances on our renovated RSC “Olimpijsky” competition Arena! - Installed synthetic surface and in ground equipment. European Indoor Championships in Goteborg was a debut of our Synthetic Surface System VSS-1. What might describe the effectiveness of surface better and independently than Athlete’s results? Full results would be found on EAA web cite. 2. NR of Ukraine / World Leading performance of Olga Saladukha in women’s Triple Jump 14 m 88 cm. 3. World Leading in women's Long Jump by Russian Darya Klishina 7 m 01 cm. 4. World Leading performance in men’s Triple Jump by Daniele Greco, Italy.17 m 70 cm. 5. The NR of Netherland / World Leading performance in heptathlon by Eleco Sinthnicolas 6 372 p.
Cascade of PB’s and NR in women’s 60 m and two WL in men’s sprint. Ladies and Gentlemen! What would you say about attempt of Renaud Leviliene on 6 m 07 cm in men’s Pole Vault? We satisfied with debut of synthetic surface VSS-1 made by Estonian company Kanstet. We will make it even better for the next Championships. Today IAAF granted Facility Certificate to our Arena built in Scandinavium Indoor Hall for European Indoor Championships 2013. http://www.goteborg2013.com/ Arena consists of 200 m Portable Track, the infill laid down to intermediate floor raised to height 3.2 m and warm up track installed at Svenska Messän premises. The portable track was manufactured at production facility in Estonian city Paldiski and delivered to Göteborg on 6 trailers. Installation crew of 15 people started on 13-th of February. Within 14 days our guys assembled 200 m Portable Track, installed 2 800 m of synthetic surface of infill and made 1 600 m of Warm up Track. First time in the history European Indoor Championship will happen on synthetic surfaces of two different manufacturers. The running oval is well known Regupol AG of German company BSW, which we already used for our Moscow’s World Championships Portable Track in 2006. The surface of infill is our sandwich surfaceVSS-1. Follow us on our news for more technical results. The Warm Up Track made as 150 m running oval and separate sprint straight not only provided additional convenience for athletes but allowed whole facility to be certified as highest Construction Category I. Here in Goteborg we will support all athletes and wish them to improve PB’s, NR’s also ER’s and World Records, because we know the taste of success obtained in no compromising battle. Today IAAF granted new Product Certificate to our Synthetic Track Surface system VSS-1. Tested by IST and Certified under the nr. S-13-154 this sandwich system complies with all IAAF requirements for use on indoor and outdoor Athletic Tracks. Debut of VSS-1 would happen on European Indoor Championships which will take place on 1-3 of March 2013 in Göteborg (Sweden). 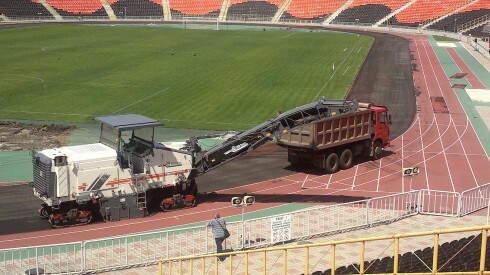 Same surface we going to use on other our prestigious project – Stadium of RSC „Olimpijsky“ in Donetsk where World Youth Championships should happen in July 2013. Follow us on Kanstet’s News and we will continiously up date results and perfomances showed on the VSS-1. Since end of June we are busy with manufacturing of our next Portable Running Track. This Track is going to be competition Arena of European Indoor Championships 2013, Goteborg, Sweden. The competition would be held in Scandinavium Indoor Facility. The hosting building in Goteborg unfortunately isn’t big enough to accept 200 m banked bend Track on its permanent floor. Smart solution founded by Got Event management and Architects. The temporary intermediate floor would be raised up to 3.2 m above existing floor. We are going to assemble our Portable Track on that structure. We going to cut, weld and hot galvanize over 50 000 kg of metal pipes before shape it to the banked bend Running Track. Our construction might be perfectly installed over any irregular floor due it has five height adjustable bolts on each of 240 supporting legs. 480 floor panels are firmly fixed by fast locking system. Follow us on Kanstet News, we would regularly update the Project status. IAAF World Junior Championship 2013, Donetsk, Ukraine. Main Arena reconstruction just began. We make that Track IAAF certified Class I, construction category I facility. Donetsk's Track is going to be first Class I facility within the territory of former USSR. Our Guys just returned from Bulgaria, where they completed IAAF Class II line marking at the track in Ruse. Just 12 h flight from Amsterdam to Sao Paulo and we are in Wonderland. 40 min flight next morning and welcome to Paradise. City of Blumenau, Santa Catarina State of Brazil. The newly built IAAF Class II running track of SESI Blumenau sport complex has been destroyed by flood. The level of river water increased over 10 m. and whole stadium was covered by 2 m of mud & water. Synthetic surface remains intact but the asphalt sub base underneath has changed dramatically. The owner of the sport complex had no other choice than rebuild the track again. The leading company on Brazilian sport surface market Recoma successfully completed rebuilding works and installed new Regupol AG surface. As far as Sesi Stadium was previously certified by IAAF, the renovated track should pass through Certification System again. To check and approve conformity of line marking and facility layout to IAAF requirements Recoma engaged our surveyors. The Sesi Blumenau Athletic Track meets all requirements of IAAF Class II facility. The Survey Report has been submitted for inspection to IAAF Technical Committee.